There are currently 3,778 users on this website. I came across this eBay listing and evidently the seller is not too happy with eBay. They are "making' him write forgery on the back of this stamp in ink. In his auctions, it says plainly this is a fake. My question is,that normal everyday ink is not acid-free,so say a person collects fakes, wouldn't this destroy this "stamp"? In scrapbooking,its huge no-no to write on the backs of pictures in ink, I can't see why it wouldn't also eventually destroy this also? I am a firm believer in passing on to the next generations, and therefore preserving things correctly. I want to make sure that I know how to preserve my stamps, and this listing made me wonder. I know heat or cold in extremes is bad, as is acid and ligins, anything else? I don't know about normal everyday ink, b ut there has to be some kind of ink, that doesn't really damage the stamp, as every expertised stamp comes with a sign on it's back, "stamped" on with ink too. In my opinion fakes should be marked as such. The collectors of the real ones don't seem to have a problem with their stamps beeing marked as real ones by an expert, so why should the collectors of fakes be bothered? I just don't think that you should have to write "FAKE" in huge capital letters on the back with a ballpoint pen. Wouldn't be a small "Faux" be enough, like it is here? would a pencil be ok? Unless I am mistaken, I believe that current conventions do not include expert marks on the back of stamps. Indeed, the consensus in the literature would seem to be against any markings on the back of stamps. It would seem to me that the seller has done all that he/she should be required to do by clearly declaring the nature of the offering as a fake of some description. While I'm all for IDing and removing album weeds, I do subscribe to the thought of never marking on a stamp for any reason at all. In the past, expertizing services would put their mark on the back of the stamp in indelible ink. If from a qualified and known expertizer, I've never know this to cause any problems to the stamp, or the ink to run. As cgrotha points out, the current practice is to issue certificate with a scan/photo of the stamp, rather than to mark on the back of the stamp. NUMBER ONE reason why I discourage marking the stamp as a forgery: I can be wrong, and sometimes the experts are wrong; there are cases in which stamps were expertized as fake and then later expertized as genuine. Sometimes new information comes out that indicates certain features used to ID a fake turn out to be a genuine print run (plates do wear down and get damaged over time). The big spenders don't want a genuine stamp that is marked fake. I think it would be preferable to set the forgeries aside in a glassine or album section labeled forgeries... That way the next person that gets those stamps will know. There are those who collect forgeries. The only case where I encourage marking a stamp as a forgery is by the forger himself. Yes, this actually happens. A few of the classic forgers would do this to "legalize" their activity. However, they did not use indelible ink, and it was pretty easy to wash off the mark. As for me..fakes and forgeries make an excellent back of book collection..try it you may like it ! I notate under or above the stamp on a graph paper page..i would not write on it !! To further this discussion, if people do collect fakes and forgeries, how are these to be priced? I have some fakes, and my thought has been to destroy them so that someone, at sometime, doesn't try to sell them as the real thing. I have looked at his offer, and in this case it would seem that marking the back "fake" in ink wouldn't matter since no one would be likely to come along later and decide the stamp was real. He currently has 63 of these listed, in both singles and pairs, and even the backs look identical. During the past 2 weeks 51 of these have ended, 15 of which have sold mostly with a "Buy It Now" at $2.00 for a single and as high as $8.00 for a pair. It appears that the seller might be turning these out himself with the aid of modern technology. modernwho, I hadn't checked the rest. Hmmm...methinks he doth protest too much, huh? I don't have a problem with fake items being marked as such on the back - as long as it is done so that the mark can't be seen through the front. It couldn't be in pencil but a nice small, light ink notation should be ok. Speaking of fakes and forgeries--there were 3 different forgeries of this Liberty Bell design circulated--all were perforated on all four sides. The real McCoys were only issued in booklet-pane format--perfed on 2 or 3 sides (Scott 1595) or in coil format-(Scott 1618). This bad forgery was lithographed in sheets of 400 (four panes of 100) on untagged off white paper and then perforated 12. The clapper at the base of the bell is open unlike the real 13 cent stamp. Maker of this forgery was never found, but a package of four MILLION was found floating-yep, floating- in the Charles River in Mass before 1981. 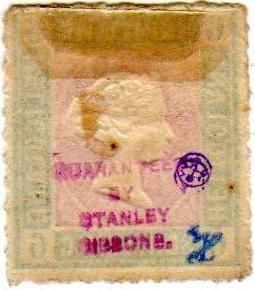 But a few copies found their way to some collectors making it more VALUABLE than real 13 cent stamp. Info from Fakes and Forgeries book-thanks nr-notrare for the info! Nobody gets in to see the Wizard. Not nobody. Not No How!" It took 0.71 seconds to lick this stamp.